I will be bringing home my guest post tutorials over the course of bringing home my baby. 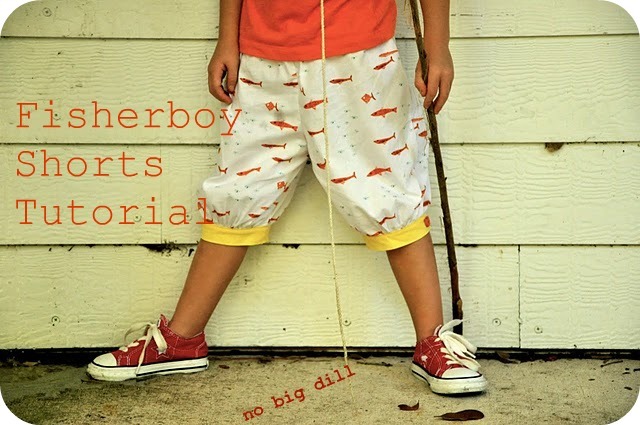 Fisherboy Shorts are for both girls and boys, super fast to make and awfully cute, no? Thank you for the invitation to be here today! 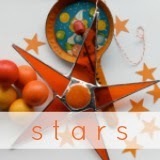 MaryJanes and Galoshes always has something enthralling posted, so I was flattered to be asked to guest post. Several years ago, someone who knew I sewed for my girls asked if I made my own patterns. I guffawed that she thought I was able to do such a thing! But, as my confidence in my sewing abilities grew over time, I am now to the point where many of the clothing items I sew are my own designs. To get to this point, I started by making simple alterations to existing patterns, which is what I'm going to show today. A two-in-one: Pattern alteration and Fisherboy Shorts! I don't usually cut out individual sizes so I can use it multiple times as my girls grow. Trace the size you are going to use (I show size 4) and extend the hem 3-4" down the side seam, and extend the inside seam straight down, starting from the top corner, instead of tapering in. The amount you add will depend on the height of your child, so hold up the pattern piece where it is marked "waistline" to your child's waist. Keep in mind that we'll be adding another 1" of contrasting band. Sew, clip and zig-zag or overstitch (serge) the center front seam and center back seam, right sides together. Open each piece and with right sides together, stitch inner seam and side seams, clip and zig-zag or overstitch (serge). Fold waist down 1 1/2" and press. Open and fold very edge under 1/4". Fold down again and edgestitch (1/8") all the way around. Stitch again along the inside of the casing, leaving 2" open in the back. I like to stitch my casings twice, as they seem more finished and structured than a single stitch. For proper length of elastic, fit it around your child, making it slightly smaller than their waist. Thread elastic through casing, overlap ends 1/4" and zig-zag stitch together. For the contrasting band, cut 2 rectangles: 11" X 3". (I used these same dimensions for both a size 4 and size 2, but again, measure your child to make sure it is the right size). Fold in half lengthwise and press. Open and fold one side down 1/4", press. Baste 2 rows of stitches 1/8" inside and another 1/8" away from first stitching line leaving the threads long around the leg opening, starting and stopping at the inner seam. Fold each band in half, with right sides together and stitch 1/4" leaving the top edge folded down. Press seam open, turn right side out. Turn shorts inside out and place the non-folded edge of the band inside and along the leg opening. Line up band seam with inside leg seam and pin. Find center of band and pin to outer seam of shorts. Gather edge of shorts by pulling on two thread ends until the band and shorts are the same length. Wrap your threads in a figure 8 around the pin to secure. Spread the gathered fabric evenly. Repeat on the other side of the leg and stitch 1/4" around the leg opening. Repeat process on other leg. Fold band along the pressed fold and pin in place. Edgestitch on each side of band (stitching 1/8" in from each side). Add buttons to outer seam if desired, which, really, why wouldn't it be? Even if you don't have fancy labels of your own, I like to put a bow or a small piece of ribbon in the back to let my little one know which way is the front and back. Tuck the ribbon inside casing and stitch to close and secure. Finished! Time to go fishing! These are adorable. I'm definitely pinning this tutorial for next summer! I have made these and they turned out so cute! Very cute. Will have to give em a try. you are such an inspiration..
Good idea on the ribbon!!! Thanks! I just made my son a pair of "refashioned" pants and was wondering what I could do so that he would know which side was the back! My son had these adorable hand-me-down jacadi knicker-like pajama pants that I made a similar pattern off. They are so cute on, and he loves them. WOW! These shorts are so adorable! Do you remember the name/designer of the fabric? Love those fishes. As if I neeeded one more thing on this weekends to-do list! My youngest will be wearing a pair of these by Monday. Oh these are so cute - I wish I had someone to make them for!